In the last of my three part review on lighting I am going to address ceiling mounts and wall sconces. Ceiling mounts are directly mounted to the ceiling. There are no chain(s) or wires to bring them down to desired levels as pendants and chandeliers do. Ceiling mounts are primarily functional light fixtures, providing general lighting. If there is some space between the ceiling and the fixture it is called a semi ceiling mount. The majority of ceiling mounts are not exactly gorgeous fixtures. And, to be fair, how you can you make something gorgeous out of something so basic? There are very few elements to play with. Wall sconces too have a distinct function. Particularly in bathrooms and powder rooms. They provide lighting so we can perform certain tasks. Wall sconces provide lighting in stairwells and hallways. They can flank fireplaces, mirrors, cabinetry. Some wall sconces are more decorative in their purpose than functional. They add an interesting feature to a wall. The wall sconce then becomes a decorative element to be featured in your decor. I will review a few ceiling mounts by manufacturer and wall sconces by designer or supplier. If you are in the market for something sparkly, something glittery, I always recommend Schonbek fixtures. Schonbek is a Swarovski company which specializes in crystal (semi) ceiling mounts and wall sconces (as well as pendants and chandeliers). Going by the name, we know that these fixtures will not fall in the bargains category. However, for the right interior a Schonbek fixture will add lustre and glamour. Imagine the light coming through the cut crystal bowl and thrown into the space, all faceted and dancing. Really pretty effect. I have used Schonbek in a number of homes. A Schonbek light fixture is worth the price you pay. The Schonbek Plaza model is a more simplified version of its typical ceiling mounts (which are elaborate and ornate). At the same time it provides that little extra special on the ceiling. The Plaza will work in not only traditional homes, but also more eclectic ones. Not your regular ceiling mount for sure! In contrast, the Schonbek’s Milano is much more traditional. I would only recommend this fixture in a traditional space. The antiqued brass trim with its engraving is rich and beautiful. 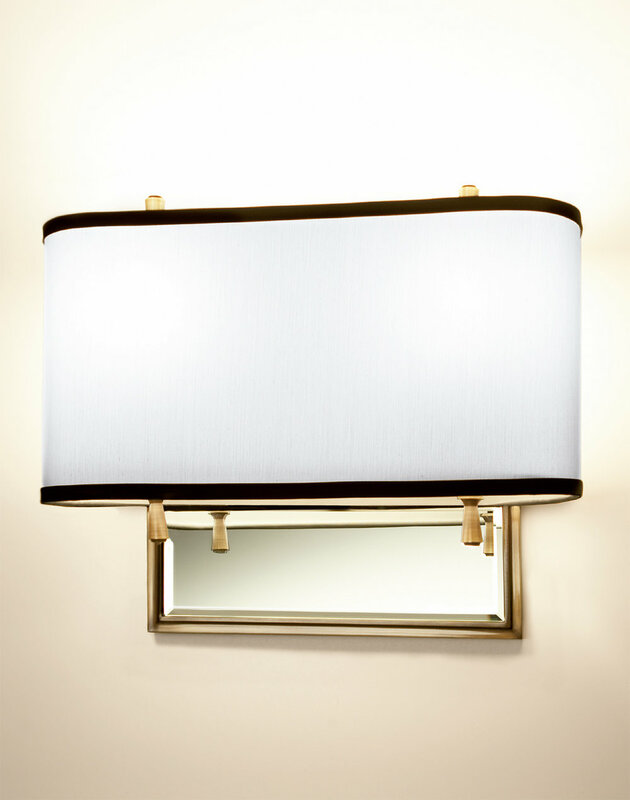 This fixture is available in no less than 10 different trim finishes! Wow, that is a lot. Anyone could fine the right one. Murray Feiss is another manufacturer which has always provided some great light fixtures. I have selected two of their ceiling mounts which fall outside the realm of the usual ceiling mount design. The first one is the Dori, the second one is the Amani. The Dori’s antiqued brass housing is suitable for LED lighting. Its faceted crystal section with its subtle flower motif adds even more interest. The Amani on the other hand is a more contemporary looking fixture. The trim is available in three finishes (oil rubbed bronze, polished and satin nickel) and in three motifs: Arabesque (as shown here), Woven and Link. Both of these fixtures can be placed in a traditional or eclectic home. The Amani could also add some interest in a more modern environment, in the right finish and the right motif of course. Murray Feiss falls in the medium price bracket. Less pricy manufacturers in North America are Kichler, Progress, Alico and Quoizel amongst others. These are all well known suppliers. Here are two of Kichler’s ceiling fixtures that pass my evaluation. Kichler’s Avon Collection has a simple fixture which is available with an 18” diameter. I like its simplicity and its size. The Arlo is not bad either. Unfortunately, with its natural brass finish it looks like the fixtures we have been using for decades. Of course, each additional layer of surface treatment (such as antiquing the brass) will result in higher prices. The linen shade is nice though, soft looking. The glass diffuser at the bottom prevents ‘hot spots’ when looking into the fixture. Since it is a semi-mount and open at the top it will be a fly catcher - literally! Lets move on to the wall sconces, a much more interesting topic! I am going to show some fixtures which are designed by either lighting designers or collected for sale by ‘curators’. I thought for the longest time that a curator is someone who takes care of museum collections. These days, people or companies call themselves ‘curators’ when they offer unique objects for sale. (Does this mean that the position of curator has lost its status? You tell me!). Most of the suppliers mentioned here only have a few designs in wall sconces available. My favourite North American suppliers are: Barbara Barry, Aerin Lauder, Thomas O’Brien, Kelly Wearstler, Kate Spade and Lindsey Adelman. Paolo Moschino & Philip Vergeylen are UK based. Any of these ‘designers’ can be found through West Elm Lighting, Boyd Lighting, Circa Lighting, Flos or their own websites. Of all those mentioned, only Lindsey Adelman is a true lighting designer. The rest are ‘curators’. Regardless they all have some interesting fixtures in a variety of finishes, from gold and silver leaf to polished nickel and rope. Paolo Moschino and Philip Vergeylen bought the interior design company Nicholas Haslam back in the nineties. Under the Haslam and Moschino name this company has produced quite a few award winning designs. I particularly liked their Green Oaks wall sconce (see above). This fixture is made from a woven core rattan complete with natural rope details. Not for everybody or every room, but quirky none the less. Great for the kids rooms or cottage. Creative Lampshades is a company from which you can order any shape of lamp shade in any colour. They are super versatile. The Scallop above is from them. Check them out! Any shape you can think of in any material is available. Good resource. Aerin Lauder, of the famous Lauder family, has some very interesting light fixtures. I am showing the Clarkson above. This looks like quite a conventional fixture. Except it is not, not really. The shade is a linen one, not glass as you would expect. And it swivels! 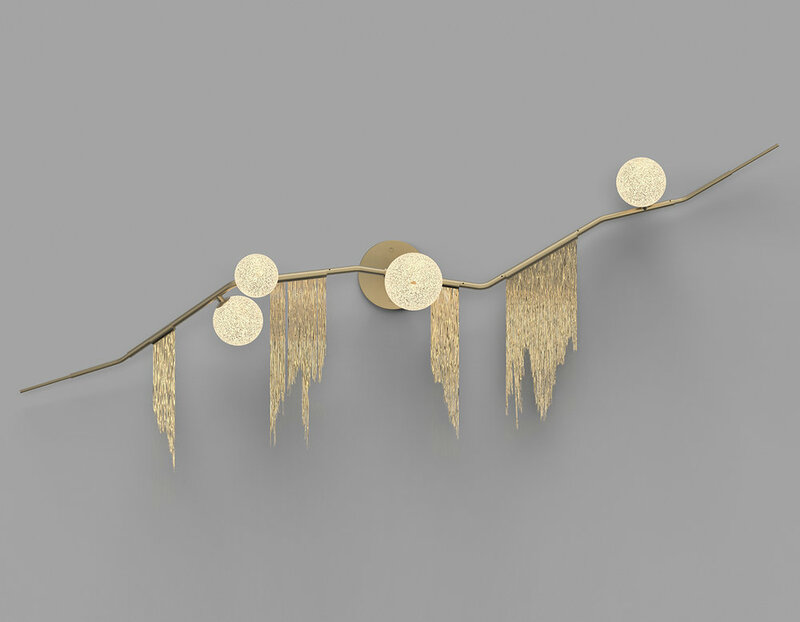 Now that makes this wall sconce truly versatile. Great for bedrooms and night time reading. In closing I want to mention Lindsey Adelman, a true lighting designer. Adelman is a native of New York City. She specializes in more or less “industrial modular [lighting] systems to capture the ephemeral, fleeting beauty of nature” (www.lindseyadelman.com). And her fixtures are exactly that: ephemeral, delicate yet strong, dreamlike. Beautiful. There are many more very interesting light fixtures; too many to show in one or three articles. More will be featured in future writings. I would love to hear your thoughts. Leave me a comment and I promise to answer. As always, thank you so much for visiting!